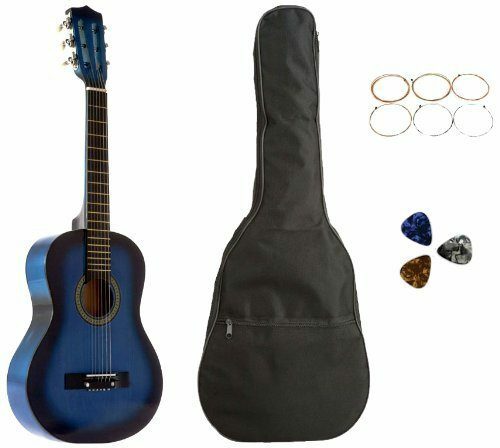 Acoustic Guitar 31 Inches Blue with Bag, Strings & Picks Only $16.19! Down From $100! You are here: Home / Great Deals / Amazon Deals / Acoustic Guitar 31 Inches Blue with Bag, Strings & Picks Only $16.19! Down From $100! Extra 20% off this already great deal! Head over to Amazon to get the Acoustic Guitar 31 Inches Blue with Bag, Strings & Picks Only $16.19! Down From $100! Shipping will be FREE on orders of $35+ or if you have Prime! Don’t have Prime? Start a 30 day FREE trial! Currently priced at $20.24, use promo code 20FALLSAV to get your extra 20% off! This Kids Acoustic Guitar offers not only great sound and playability, but an affordable price which is attractive to many first-time players seeking a beginner guitar. This Guitar is 31 inches in length and features a hardwood body, lindenwood binding, steel strings and 17 frets. This Guitar makes a great gift for kids and is a great value for the money. This guitar is everything your child needs to get started playing, includes Guitar Gig Bag, Strings Guitar Set & Picks.